Home	» Sport Items » Paddle Ball » Beach set with wood racket and PVC ball. 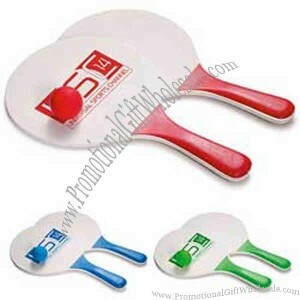 Product Name: Beach set with wood racket and PVC ball. Size: 7 1/2" x 13" x 1/4"
10 1/2" wooden paddle ball game. Two-in-one paddle ball set / game. Have some beach or picnic fun with this outdoor paddle game. Outdoor paddle game, includes 2 wooden paddles and a rubber ball. Beach paddle ball game. Includes two wooden paddles and 1 ball. Dog Face - Animal design paddle ball.